JANE AUSTEN was born at the Rectory in Steventon, a little village in north-east Hampshire, on 16th December 1775. 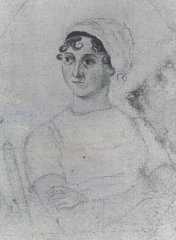 She was the seventh child and second daughter of the rector, the Revd George Austen, and his wife Cassandra Leigh. Of her brothers, two were clergymen, one inherited rich estates in Kent and Hampshire from a distant cousin and the two youngest became Admirals in the Royal Navy; her only sister, like Jane herself, never married. Steventon Rectory was Jane Austen's home for the first 25 years of her life. From here she travelled to Kent to stay with her brother Edward in his mansion at Godmersham Park near Canterbury, and she also had some shorter holidays in Bath, where her aunt and uncle lived. During the 1790s she wrote the first drafts of Sense and Sensibility, Pride and Prejudice, and Northanger Abbey; her trips to Kent and Bath gave her the local colour for the settings of these last two books. In 1801 the Revd George Austen retired, and he and his wife, with their two daughters Jane and Cassandra, left Steventon and settled in Bath.